Summary: Microsoft Scripting Guy, Ed Wilson, talks about using the Continue statement in looping. Microsoft Scripting Guy, Ed Wilson, is here. Dude, dude, dude (or dudette). TechEd 2014 is nearly here. Tomorrow the Scripting Wife and I jump onto a big old hairy plane and head to Houston, Texas for TechEd 2014 North America. We will head to the Convention Center, and begin the task of assembling the Scripting Guys booth. Look for pictures and ad hoc Hey, Scripting Guy! Blog posts as I try to help you join into the virtual awesomeness that is TechEd. If you are going to be there, make sure you keep up-to-date with the Scripting Guys' guests, know where to locate the Scripting Guys booth, and even pick up a few session suggestions from the Scripting Wife’s ideal TechEd schedule. It is nearly here! One of the things that is a bit confusing for beginner scripters (and even for some intermediate scripters) is the Continue statement. This is partially because it does not act like it might in some other scripting languages. 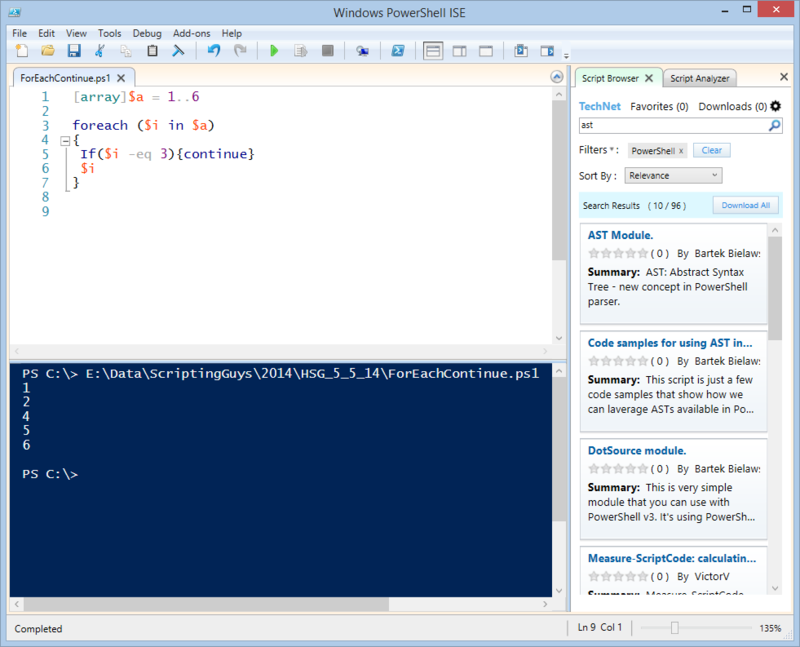 So, what does the Continue statement do in Windows PowerShell? It returns flow to the top of the innermost loop that is controlled by a While, For, or Foreach statement. Probably the best way to understand this is to see it in action. Note To read more about looping, see these Hey, Scripting Guy! Blog posts. The following script displays the numbers 1 through 6 as the script works its way through the array. Here is the output. 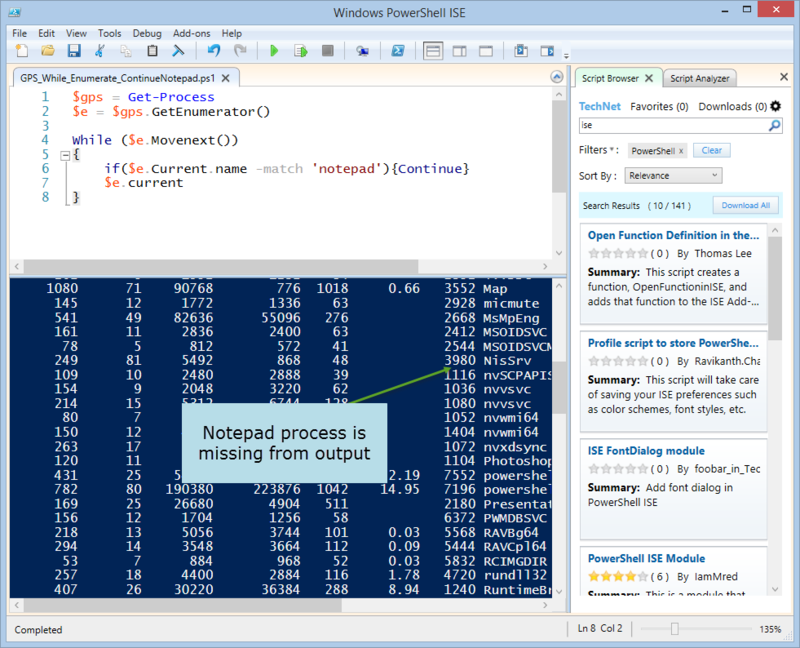 Pay attention to the portion of the output that displays the Notepad process. That is all there is to using the Continue statement. This also concludes this series about looping. 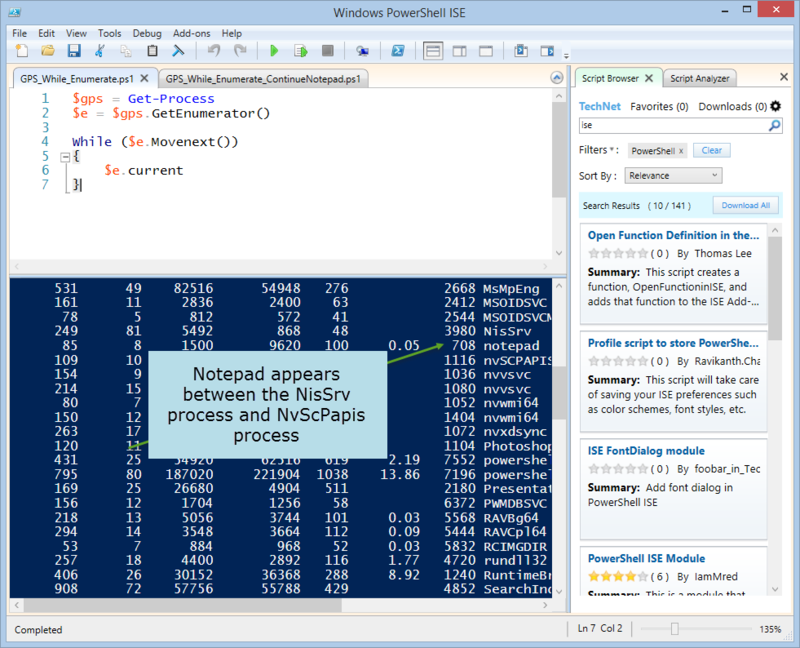 Join me tomorrow for the Weekend Scripter when we will talk about some really cool Windows PowerShell stuff.